December 14, 2016 – Mike Hennessy, Sr. Which Lung Cancer Groups Should Get Radiation? No matter how long you've been a smoker, quitting is still possible and the anti-cancer benefits are huge. You might say that smoking came naturally to Donna Fernandez. 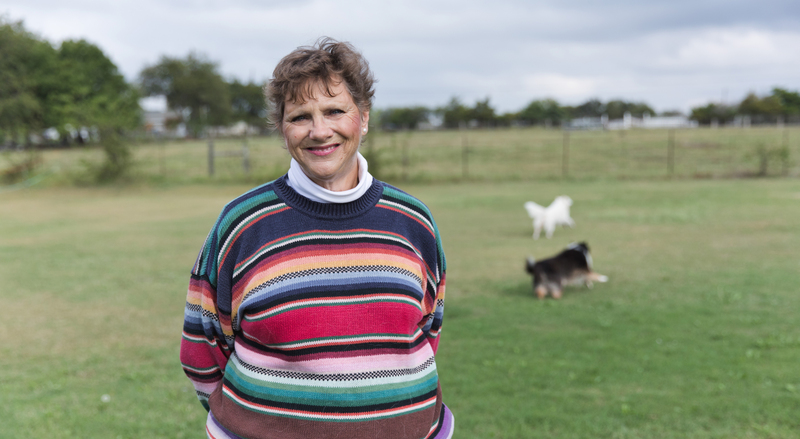 The 63-year-old Dallas resident grew up watching her dad smoke cigarettes and pipes. She was 16 when she took her first drag and 24 when she learned that her dad had lung cancer that had spread to his bones. “He stopped smoking cold-turkey that day,” she recalls. Despite her father’s death just six months later at age 49, and the knowledge that she could face a similar fate, Fernandez continued to smoke two packs a day for almost 40 years. “Nothing compares to the feeling you get from smoking a cigarette,” she says. Finally, in 2009, Fernandez decided that cigarettes were costing her too much — both in terms of money and her health. Although she took it for just three weeks instead of the full recommended course, the prescription smokingcessation medication Chantix was one thing that helped her quit. She’s been smoke-free for seven years. But four years after Fernandez took her last drag off a cigarette, she noticed a knot on her collarbone. “I thought I might have thyroid cancer,” she recalls. Instead, a CT scan revealed that undetected lung cancer had spread to her lymph nodes. The Centers for Disease Control and Prevention (CDC) rank cigarette smoking as the leading cause of preventable disease and death in the United States. It’s to blame for almost 90 percent of lung cancer diagnoses and one out of five deaths every year. There are two main types of lung cancer: small cell and non-small cell. Non-small cell lung cancer accounts for up to 85 percent of diagnoses and is the most common one seen in nonsmokers. It tends to be slower to spread and easier to treat than small cell lung cancer, which is almost always linked to smoking. When inhaled, the chemicals in cigarettes can cause cells in the lungs to mutate or change. As these abnormal cells grow uncontrollably, they can form cancerous tumors that destroy healthy lung tissue. Particularly if left untreated, lung cancer can spread throughout the body, typically first to the chest wall or into an airway, and then, most often, to the lymph nodes, bones, brain, liver or adrenal glands. Smoking also increases the risk that someone will develop other kinds of cancer, as well as heart disease. Because the lungs have few nerve endings, there’s little, if any, pain or discomfort during the early stages of cancer. Occasionally, respiratory problems, such as a persistent cough or frequent bouts of bronchitis or pneumonia, crop up. By the time more troubling symptoms start to appear — weight loss, headaches and bone pain or fractures — the disease is advanced and less treatable. Of course, not everyone who gets lung cancer has a history of tobacco use. Up to 15 percent of people affected by the disease have never smoked. Some may have been affected by secondhand smoke in their homes while growing up. Others may have been exposed to asbestos or radon, a radioactive, odorless gas naturally produced by decaying uranium in the soil. Radon, the second-leading cause of lung cancer, seeps from the ground into homes and buildings. If a radon detection kit purchased online or at a home-improvement store indicates that your home has unsafe levels, a professionally installed radon mitigation system can make the air safe again. In some cases, it is not known what has caused a person’s lung cancer. Researchers have found that a specific kind of gene mutation — which encourages cells to grow out of control, and which is treatable with targeted drugs — is much more common in never-smokers than in people who have smoked. Still, smoking cigarettes remains the greatest risk factor for developing lung cancer. So why don’t smokers just quit? Many of them — nearly 70 percent, according to one recent CDC survey — want to. But kicking the habit is hard. Really, really hard. He’s right. Schonter has a better chance of beating the disease if he stops smoking for good. A British Medical Journal study found that people with early-stage lung cancer can double their five-year survival rate by giving up cigarettes. Those who don’t stop may develop another type of cancer or experience a relapse of treated lung cancer. Smoking also weakens the effectiveness of cancer treatments while making their side effects worse. The fact that smokers like Schonter struggle to quit, even when faced with cancer, demonstrates the powerful hold cigarettes have. Nicotine, a drug naturally found in tobacco, may be as addictive as heroin and cocaine. “With each draw of a cigarette, the brain releases dopamine, a hormone that produces pleasurable feelings,” says certified tobacco treatment specialist and family nurse practitioner Melissa Stanley, who is also the lung cancer screening program coordinator at the University of Virginia Cancer Center, in Charlottesville. “As soon as that feeling fades, you need another cigarette.” Smokers also build up a tolerance to nicotine, meaning they need to smoke more to get the same feel-good effects. This physical component is only one part of the addiction problem. “For many smokers, reaching for a cigarette during certain times of the day, or while doing an activity like driving, or when stressed, becomes an ingrained part of their routine. This is the mental part of addiction,” explains Bill Blatt, director of tobacco programs for the American Lung Association. Then there’s the social aspect of smoking, such as taking smoke breaks with coworkers or lighting up while out to dinner or drinks with friends. “A smoker’s chances of quitting for good are greater when you address all three of these addiction links,” says Blatt. For many smokers, figuring out how to quit is a challenge. “There is no right way to quit,” says Stanley. “What helped one former smoker might not work for another.” Going it alone (the infamous “cold turkey”) seems to be the worst approach. “The long-term success rate is approximately 3 percent,” says Stanley. Of the seven FDA-approved smoking-cessation aids, five are nicotine replacement therapies (NRTs). These products deliver controlled, small amounts of nicotine via gum, lozenges, skin patches, inhalers or nasal sprays to help wean smokers from cigarettes. They work by easing nicotine withdrawal symptoms and reducing the urge to smoke. Even though NRTs contain nicotine, studies show that smokers who use them double their chances of quitting without increasing their cancer risk. Chantix, the prescription medication that worked for Fernandez, blocks dopamine’s feel-good effects. “Cigarettes become less pleasurable, so your desire to smoke decreases,” says Stanley. Other prescription drugs, Wellbutrin and Zyban (bupropion), are actually antidepressants. They work on brain chemistry, helping to blunt nicotine cravings. Research shows that combining medications and/or NRTs with counseling offers the highest chance of success. “Counseling teaches techniques to avoid triggers,deal with cravings and manage the behavioral and mental aspects of smoking,” says Blatt. Counseling doesn’t need to take place face-to-face in order to help. Toll-free telephone quit lines are available in every state and the District of Columbia (see “Getting Help”). Trained counselors help callers find the best quit plans based on their personal smoking histories. Studies indicate that smokers who use telephone counseling services have twice the success rate as those who don’t. Support groups, either in person or online, also make a difference. “The phone and Internet are especially helpful for smokers who live in rural areas where smoking is more prevalent, yet access to smoking cessation programs is limited,” says Blatt. He noted that the American Lung Association offers a Quit Now: Freedom From Smoking online support group and discussion community, available at inspire.com/groups/freedom-from-smoking. Some former smokers credit e-cigarettes with helping them cut back and eventually kick the habit. These mechanical cigarettes have a battery that heats up a cartridge of liquid nicotine solution. Users then inhale the nicotine vapor. The cartridges come in varying strengths of nicotine, giving smokers a bit more control over how much nicotine they take in. “The problem is that there are hundreds of e-cigarettes on the market and the FDA isn’t yet regulating them,” says Blatt. “This means you could get more nicotine than what the package says.” You also may be inhaling other dangerous chemicals. One study found higher levels of nickel and silver in e-cigarette vapor than in cigarette smoke. “Because e-cigarettes are fairly new, we don’t have any comprehensive, long-term studies to show whether they are more or less harmful than actual cigarettes, or whether they help or hurt smoking-cessation efforts,” says Blatt. While a 2016 Cochrane Review indicates that e-cigarettes may increase the chances of a successful quit effort, the researchers also noted a lack of studies about long-term effects. For this reason, most smoking-cessation experts recommend sticking with NRTs that are proven to be effective and safe. Some smokers are interested in using complementary therapies, such as acupuncture, yoga, meditation or hypnotherapy to help them quit, sometimes in combination with FDA-approved tools, but there is little evidence, so far, showing that these methods increase success. The good news is that Americans are winning the war against tobacco. More than 52 million smokers have successfully broken free from cigarettes, according to the American Lung Association. In fact, says Carly Ornstein, the organization’s national director of lung cancer education, former smokers now outnumber current smokers by an estimated 16 million. And, as the adage goes, it truly is never too late to stop. Quitting today reduces your risk of dying from lung cancer in half in just 10 years. Even if you already have lung cancer, there are still plenty of reasons to remain hopeful. “We’ve made a lot of progress with lung cancer treatments in the last 10 years,” Ornstein says.